To function, the intestine must absorb nutrients but also send food onward. The ability to move food onward is called “motility” and is driven by timed contraction of the intestinal muscle. The gut interacts with the brain to determine the pace of contraction and therefore, food motility. Unfortunately, sometimes the timing of contractions can go haywire. Cannabinoids, whether naturally occurring endocannabinoids or externally administered cannabinoids, have been shown to reduce motility in a dose-dependent matter. In other words, the more cannabinoids supplied, the slower the food moves through the gastrointestinal system (to a point). Scientists who initially observed this effect dug deeper by applying cannabinoid receptor antagonists to block effects from cannabinoid receptors. While the CB2 receptor blocker had no effect, the CB1 receptor blocker caused motility to resume as if cannabinoids had not been applied, indicating that these motility effects occur in response to activation of the CB1 receptor. Since the body’s two main endocannabinoids, anandamide (body’s version of THC) and 2-AG, both bind to the CB1 receptor, both are capable of influencing motility in the intestine. Of course, while supplying more external cannabinoids represents one method of stimulating a change in motility, disabling the body’s enzymes can also lead to greater activation of cannabinoid receptors. Specifically, inhibiting MGL, the enzyme that deconstructs the cannabinoid 2-AG, allows more 2-AG to stay bonded to CB1 receptors, allowing a prolonged change in intestinal motility. In response to a recent study involving enzyme inhibitors in which participants were hospitalized, we now know that disabling this inhibitor in humans may be dangerous and may not be a viable pathway for treating a gut condition where decreased motility is required. However, since effects were once again not observed in the presence of a CB1 receptor blocker, this represents a second confirmation that CB1 receptors control motility in the intestine. Everything in the gut is related. In fact, the type of food we eat even has an influence on cannabinoids released by the human body. In multiple studies, high fat diets were shown to reduce anandamide and to increase 2-AG throughout the gut. Researchers are currently unsure why these cannabinoids would adjust in opposite directions, since both activate the CB1 receptor. Additionally, since this measurement was taken overall, rather than in specific tissue layers of the organ, we are not sure that this trend holds in every region. However, the effect is significant and immediate. Additionally, these cannabinoids even affect our taste. In the 30 minutes immediately following a high fat intake, cannabinoid levels spike. This does not occur in any other major organ (such as the heart, brain, etc.) and additionally does not occur in response to any other nutrient family (such as carbohydrate, protein, etc.). Interesting enough, this effect occurs merely after tasting fat, before fat has actually entered the stomach, meaning that signals from the oral cavity (taste) are transmitted to the gut. Activation of the CB1 receptor signals the brain to further associate the taste of fat with positive reward, which in turn encourages more eating. Why? Researchers believe this could be an evolutionary adaptation. Some theorize that in times when food was scarce, the body learned to encourage itself to consume as many calories as possible at times when those calories were available. Regardless, this explains why foods tend to taste better under the influence of cannabis (and why cannabis users often eat more than intended in one sitting! ); your gut literally increases the pleasure of taste in response to fat, and this effect is amplified by cannabis consumption. While this study has yet to be performed in humans, rodent studies have confirmed that levels of the natural cannabinoid, 2-AG, spike during fasting. In fact, after 24 hours of fasting, mice have consistently higher levels of 2-AG than mice that have been allowed to continue normal feeding. These levels “rapidly returned to baseline […] by 15 minutes after refeeding”. That means 2-AG has a relationship to extreme lack of food. Potentially it means that 2-AG encourages the body to find food more attractive as necessary to prevent from starving. Rimonabant, which blocks CB1 receptors, has been shown to prevent the rise in 2-AG that occurs from fasting, meaning that this effect is also achieved through activation of the CB1 receptor. Interestingly enough, combined with the findings about 2-AG involving taste, we see that 2-AG spikes both during consumption of high fat food and also in extreme hunger, environmental stimuli that are seemingly at opposite ends of the spectrum. Beyond these effects, cannabinoids have emerged as a potential treatment for Irritable Bowel Syndrome, which we’ve covered in previous blog posts. This effect likely has less to do specifically with the gastrointestinal system and more to do with the general anti-inflammatory effect of cannabinoid receptor activation on cells. When intestinal cells become inflamed, intestinal permeability is increased, which leads to irritation. Cannabinoids reduce inflammation and repair the integrity of intestinal lining. Additionally, the endocannabinoid system can regulate gastric secretions. The secretion of stomach acid, for instance, can be regulated by cannabinoid receptor activity. When an electric current is applied to rodent intestines as a means of stimulating gastric secretion, cannabinoids have been shown to block the signal and reduce gastric secretion in both the intestine and the stomach. This list does not represent the entire spectrum of interaction between the endocannabinoid system and the gastrointestinal system. Moreover, in the same way that many of these relationships were unknown several decades ago, the next several decades will surely bring even more surprises. However, readers should now have an understanding of the multitude of interactions occurring between the two systems. The sheer number of connections makes this area of cannabinoid science one of the most exciting for us to follow, and we look forward to seeing what medicinal advancements develop from these findings. Nicholas V. DiPatrizio. 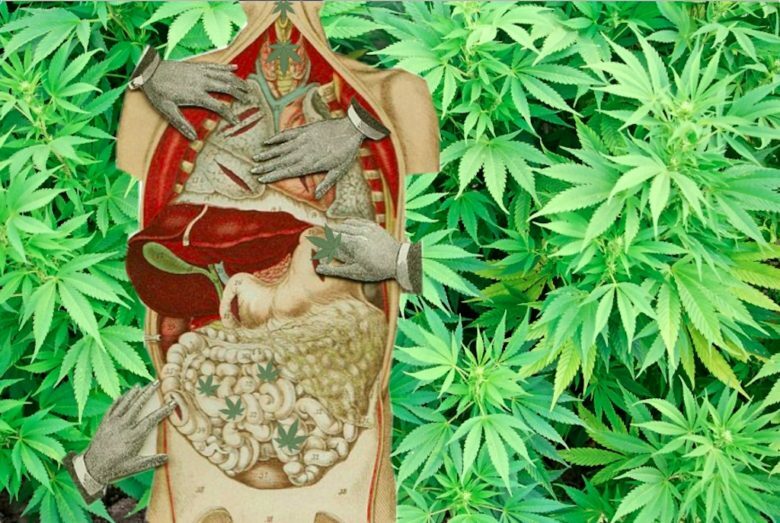 Endocannabinoids in the Gut. Cannabis Cannabinoid Res. (2016) 1(1): 67–77. DOI:10.1089/can.2016.0001.